Here in the States, we enjoy a wealth of great art, but every once in a while, there’s an album that comes along that makes you curse the Atlantic Ocean for existing because it’s released in Europe before here. Ladies and gentlemen, for your Atlantic-cursing consideration, I present Invisible Empire // Crescent Moon. As the title suggests, this is an album of duality. The writing is influenced by the death of Tunstall’s father and the collapse of her marriage. 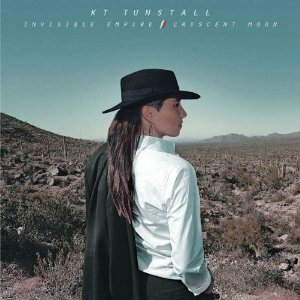 Isolated by mortality and romance, Tunstall crafts a delicate album to match the Tuscan desert on the front cover, where the album was also recorded. A Western feeling shines through on “Made of Glass,” complete with a whistling interlude as Tunstall mourns her father through lyrics like “cheating ourselves to believe we’ll be last” and “I was holding your flowers.” “Carried” becomes its own cry for help, a search for support through hard times, while “Old Man Song” shows surprising strength, asking her father, “Oh, why don’t you just play?” even as he slips away. While this record clearly comes from a place of pain, the songs are ultimately beautiful, dreamy, and intoxicating.